Be sure to check out Bosnia-Herzegovina’s festival schedule to choose the right time to travel there! Choose from contemporary showings and traditional events to see different sides of this diverse country. Enjoy a series of rich programs with some of the most beautiful voices in Bosnia-Herzegovina. The biggest independent kids’ event in southeastern Europe is a great destination for a family vacation. Keep the kids entertained with cartoon films, workshops, kiosks, jugglers, dancers, and magic shows, and maybe catch a show or two yourself! 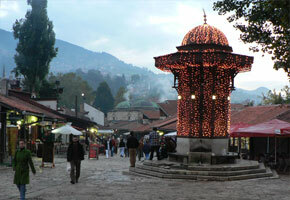 Bascarsija Nights is one of the most notable cultural festivals to come to Sarajevo. This month-long festival is filled with 40-50 events that span anyone’s interests. Free admission and the beautiful location of this festival has added greatly to its charm over the years. Enjoy literary events, children’s programs, classical music, films, and classical opera and ballet. Check them out at www.bascarsijskenoci.ba. This traditional event is held near the Kastel Fortress. What makes this festival unique is its blend of athletic events and cultural pursuits. Both artists and athletes display their impressive skills and abilities, so from kayak racing to meetings of artistic associations, there’s no way that visitors won’t find something just right. The Sarajevo Film Festival focuses on regional films, both long and short, and a variety of genres to choose from. Whether you’re a film buff or someone interested in taking in the culture of Bosnia-Herzegovina, you won’t be disappointed in this fantastic event and meeting place for artists all over the globe. Visit www.sff.ba. Life returns to the area around Banja Luka’s historic Kastel as the Summer Games draw masses from Bosnia-Herzegovina and beyond. Enjoy a youthful spirit in the balmy city, while onlookers champion (and even rival) the outstanding athletes of Bosnia-Herzegovina’s past. As training conditions improve every year, it’s just a matter of time before Olympic gold medals flood Banja Luka again. This festival takes place every October, and has been since 1960. MESS, which stands for Small Experimental Stage, offers theater and modern dance performances are hand selected from all Europe. You can explore lots of creative performances that span many different cultures and languages, sometimes providing on-stage translators for specific events. Jazzfest is Sarajevo’s jazz scene at its finest. This internationally-minded festival blends perfectly with the strong cafe culture that has regained its strength in Sarajevo. Any jazz lover should mark this festival as the perfect opportunity to experience jazz in an original, European setting. Go to www.jazzfest.ba for more details.